The Redonda Islands and their associated waterways offer three distinct and unique channels to explore and access the remote area of Pryce Channel and Toba Inlet. 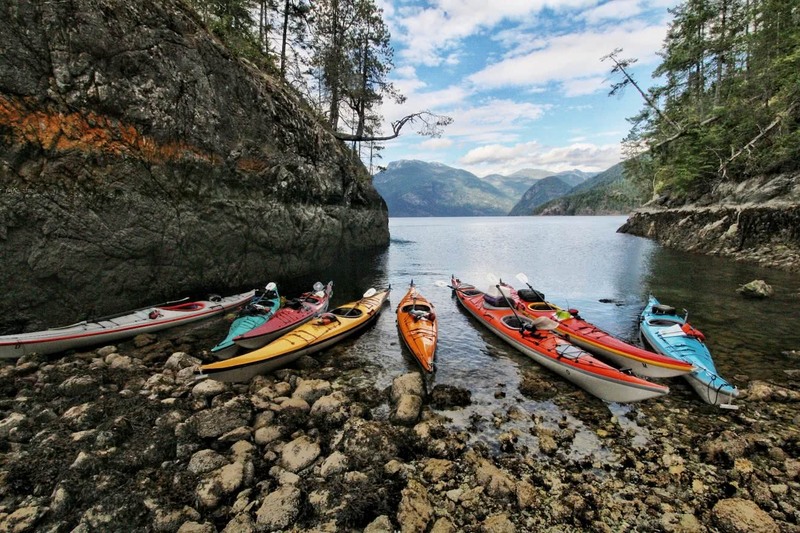 Launching from Lund or Okeover Inlet, kayaking trips of a week or more can loop around the Redonda Islands, into Toba Inlet and return to Desolation through a different channel – creating a stunning experience in a wonderful and remote area of the British Columbia coast. Lewis Channel splits the islands of Cortes and West Redonda on the north western corner of Desolation. Paddling north into this channel allows the kayaker to gently ease into the wild and rugged terrain to be found further north. The first stop for many kayakers north is the charming old boardwalk village and marina of Refuge Cove. 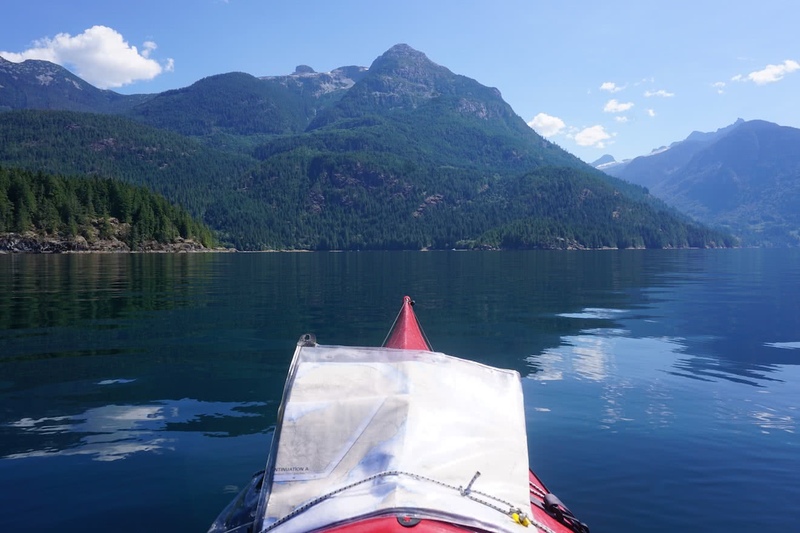 Once an important and busy community on the main shipping route up and down the coast, it is now experiencing a summer renaissance as boaters and kayakers come from all over the world to visit Desolation Sound. The scenery unfolds as you edge further north away from civilization. On the western side of the channel, Cortes Island gently passes from semi-rural homesteads to uninhabited forest, while on your right the terrain of West Redonda gradually becomes more rugged. The shoreline is a continuation of jutting points and small, welcoming beaches, inviting kayakers to easily pull in for a lunch break or pitch a tent and watch the sun disappear richly behind the Discovery Islands to the west. 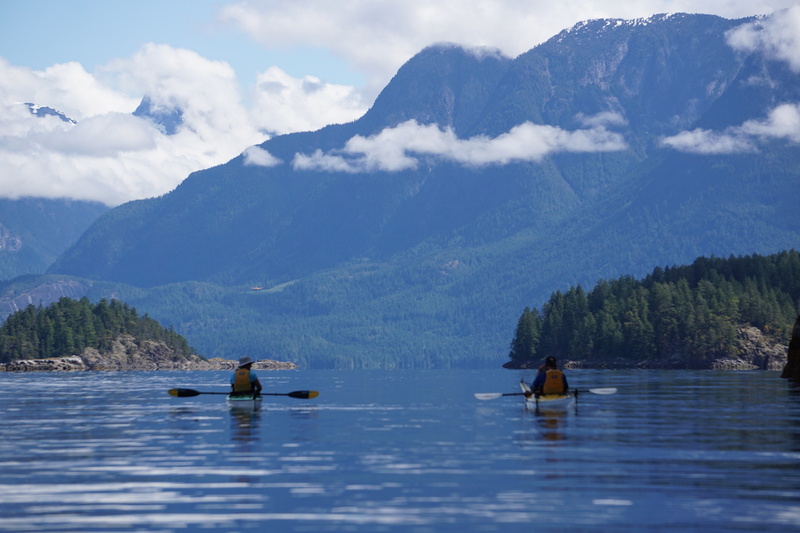 Halfway up Lewis Channel, cutting almost clean through West Redonda from west to east, Teakerne Arm is a wonderful side-trip for those kayaking in Desolation Sound and beyond. A trail at the head of the arm provides easy access up to warm and clear Cassell Lake – a welcoming swimming hole for visitors in the summer months. Just a short paddle from the base of these trails, this freshwater lake spills over the steep cliffs into the ocean in a wide waterfall. Kayakers can paddle right up to its base and feel the cool, refreshing mist as the roar of the water echoes off the steep cliffs flanking the falls on each side. Beyond Teakerne Arm, Lewis Channel ends at the confluence of a number of smaller passages, converging on the Rendezvous Islands just off the northern tip of Cortes. The landscape opens up here and offers expansive views north along Deer Passage to the Coast Mountains and north-west up Calm Channel into the Discovery Islands beyond. South Rendezvous Island, an undeveloped provincial park, offers incredible camping opportunities, with hidden coves and towering old growth trees protecting old abandoned homesteads. Very much a continuation of the ambience of Desolation Sound, Lewis Channel offers a relaxing introduction to the world beyond Desolation. Waddington Channel – splitting East and West Redonda from north to south – offers a great diversity of paddling, from warm freshwater lakes to remote island camps. Immediately beyond Desolation in the channel, Roscoe Bay and Black Lake is a calm and protected marine park and popular day paddle from the Curme Islands and Prideaux Haven. The narrow inlet snakes surprisingly deep into West Redonda Island, before opening up suddenly to reveal a wide and beautifully calm bay popular with boaters and kayakers. A short trail leads from the head of the bay along the creek just a short distance to yet another fresh water lake perfect for swimming and even kayaking if you are ambitious enough to make the small portage along the trail! North of Roscoe Bay, the idyllic and peaceful tends to give way slowly to the awesome and humbling. The shoreline of West Redonda on the left is steeper, the forest tangled. Across the channel the mighty spire of Mount Addenbroke rises sheer from the deep, glacially carved ocean to a height of 5200 feet and morning mists cling tightly to the thickly forested slopes. Behind you is the bliss of Desolation Sound, before you lies exploration and adventure. Walsh Cove Marine Park is tucked neatly into a well-protected nook at the top end of West Redonda Island. Three small islets sit below the cliffs of both West and East Redonda Islands, which come as close as 120 metres at their closest point. With great swimming during the heat of the day, the views south back to the mountains of East Redonda are picture perfect here. Butler Point, immediately north of your island camp, offer mysterious and fascinating glimpses into the past. 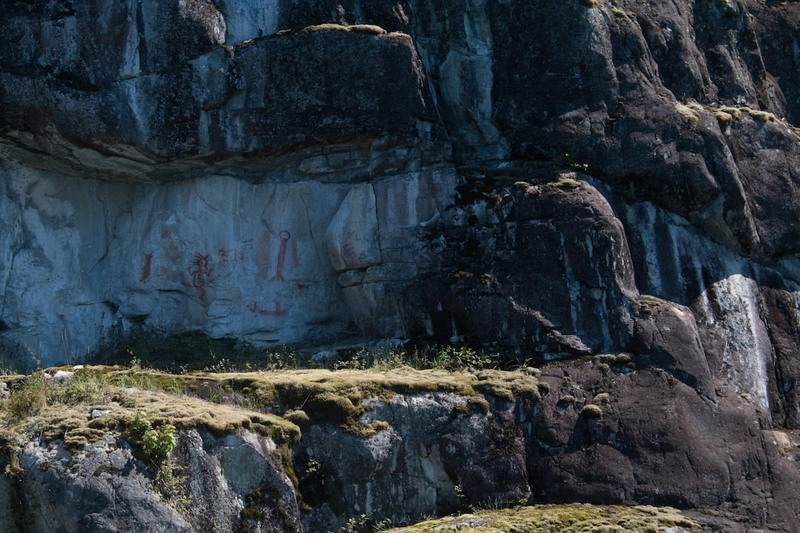 More than a dozen pictographs – Native rock art dating back to a time before Europeans discovered these lands – can be found in various places among the cliffs. Images of marine animals and human forms are plainly visible, while others provide more cryptic clues to the nature of life here far in the distant past. To the north, the mountains are silently beckoning. The channel narrows as it comes to an end. The water, for so long deep and dark, is suddenly luminous with turquoise blues and emerald greens as the glacial fed water of Toba Inlet, just beyond the passage, mixes with the open ocean. 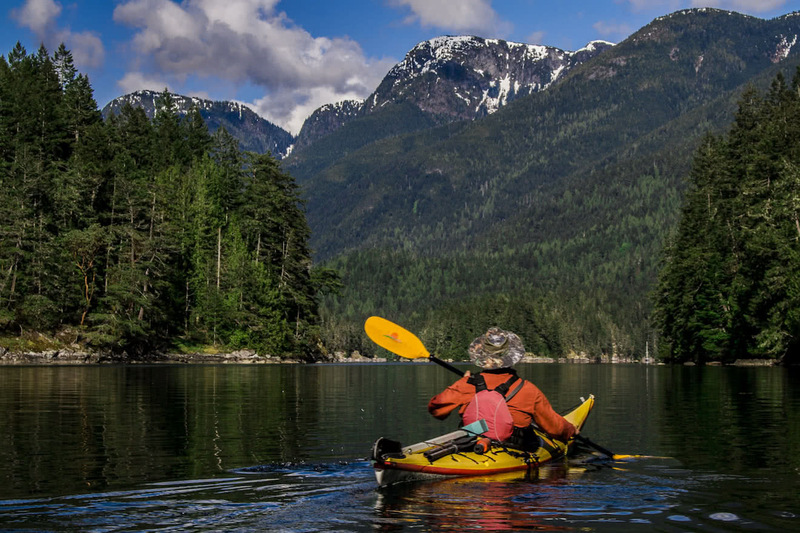 There are few experiences on the British Columbia coast that rival paddling out of Prideaux Haven, an idyllic island oasis at the north-eastern edge of Desolation Sound, and heading north into the mountains of Homfray Channel. From here on, however, the Coast Mountains are no longer a backdrop but an ever-present reality. You are from this point into the mountains, their ice-covered peaks towering thousands of feet above you on every side. Of all the incredible places to visit in Desolation Sound and its immediate area, Homfray Channel on the way north to Toba Inlet is the most humbling. Remote and imposing, every stroke takes you further and further from civilization. Thousands of years ago, vast glaciers covered most of the surface of British Columbia. Endlessly advancing inch by inch, the friction and pressure they exerted carved massive valleys out of the rock. As the glaciers retreated at the end of the last ice-age, these valleys filled with rising sea water, shaping the very landscape that we love and enjoy today. On the left hand side of the channel as you paddle north, Mount Addenbroke dominates East Redonda. From its peak 5200 feet above the ocean, it drops in immense cliffs to a depth of 2300 feet below the surface, the deepest point in Desolation Sound. The southern half of East Redonda is an ecological reserve, protecting the unique coastal slopes from development or degradation. To the east are the Coast Mountains. Water cascades down the wild, undeveloped valleys of these peaks in torrents, carving them deeper and deeper, and enters the ocean with a roar that reverberates off the cliffs all around you. At their base sit wide, flat bays provide the perfect place to set up a tent and spend the night amongst the towering mountains. Forbes Bay is one of these wide coves located at the base of iconic Mount Denman. To this day it is an important cultural site for the Klahoose First Nation, and a large parcel of the bay has been designated to them in recognition of the connection they have to this incredible location. Thickly forested, with Forbes Creek entering into Homfray Channel from the mountains above, Forbes Bay looks every bit a bear paradise … and indeed it is. Bears are often seen foraging on the shore, while eagles sit patiently and silently in the trees above. Another large bay with good camping opportunities further north is Attwood Bay. The sheltered cove is gouged out of the otherwise steep cliffs and offers good protection against any inclement weather to pass before attempting to enter the mouth of spectacular Toba Inlet to the north. 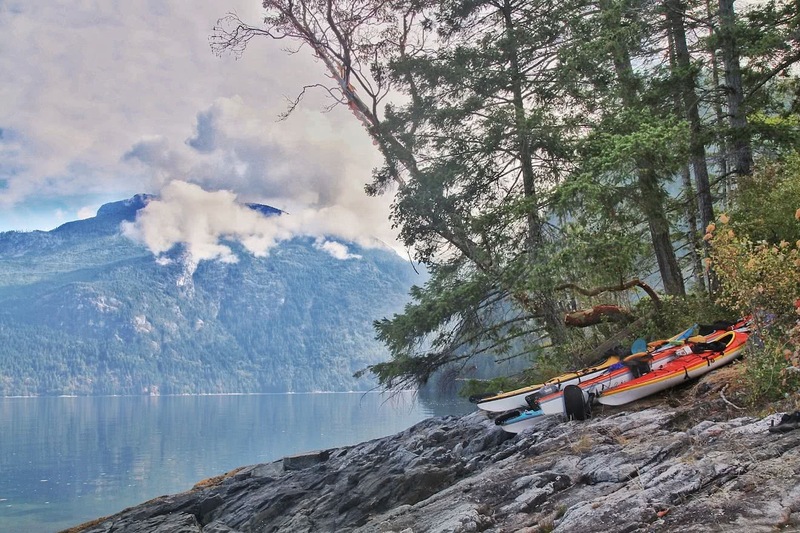 Visiting these passages and Toba Inlet requires knowledge and experience with remote sea kayaking and wilderness camping. For those guests that want to experience the grandeur of this scenery in safety and comfort, please check out our expedition-style kayak tours of 5 and 7 days into this pristine and memorable destination.